This tutorial covers making a basic ladder that you can climb in ZDoom based ports. I know this tutorial has been here for 2 months now but there's a quicker and easier way of doing this in Hexen and UDMF format. Instead of scripting, you can just simply do it in linedefs mode. 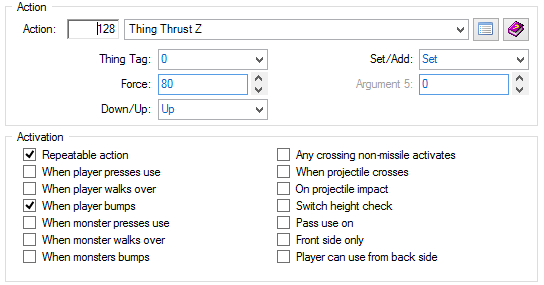 Just simply select the linedef that you want to be your ladder and type the number 128 in the box on the left side of the Actions section and you'll have Thrust Thing Z on the selection. The only thing left for you to do is mess with the settings which is pretty much up to you.